An important aspect of the experiments performed in DESIREE now and in the future is to cool stored beams of molecular ions to only one or a few quantum states to enable the interpretation of experimental results and comparisons with theory. Results of a DESIREE experiment to demonstrate the cooling of the rotational degree of freedom of stored OH– ions to the low temperature of the surroundings have been published in Physical Review Letters this week . The publication was accompanied by a Focus article in Physics by Philip Ball  describing our and recently published results from the cryogenic ion-beam storage ring, CSR, in Heidelberg . DESIREE and CSR are two of only three such rings in operation worldwide – the third one is the RICE ring at the RIKEN laboratory in Tokyo, Japan. The electron affinity of the hydroxyl molecule, OH, is 1.8276 eV meaning that for photodetachment of ground state (J=0) OH– ions to be energetically possible, light with a wavelength shorter than 678.5 nm is required. If one applies a slightly longer laser wavelength and still observes photodetachment rotationally excited states must be populated in the beam. With detailed knowledge of the wavelength-dependent cross sections for photodetachment from a given initial OH– level to a specific OH level, this can be described quantitatively. It is thereby possible to deduce the rotational distribution (and thus the temperature) of the OH– ions from the observed effective photodetachment cross section in the range of the thresholds for the first few rotational levels. This method is called rotational thermometry and was developed for OH– by the group of Roland Wester in Innsbruck . They studied buffer-gas cooled OH– in radiofrequency traps and found that for gas temperatures down to about 20 K the rotational temperature of the OH– ions followed that of the buffer gas, while for lower gas temperatures the OH– did not cool any further. As recently as July of this year, the group at the CSR in Heidelberg published a storage-ring version of the OH- rotational thermometry method . They were thus able to follow the temperature of their initially hot stored ions as a function of time after storing them in their <10 K storage ring environment. After sufficiently long storage times (of the order of 15 minutes) they found that their ions were at equilibrium at an effective temperature of 15.1±0.1 K. The fact that their ions did not reach thermal equilibrium with the surroundings is likely due to exposure to a small area of 300 K blackbody radiation for a short fraction of their orbits in CSR. Fraction of the stored OH- ions not in the rotational J=0 ground level measured as function of time after the injection when a depletion laser tuned to photodetach ions in all excited rotational levels is applied until t=380 s.
when stored long enough was only 13.4±0.2 K, in agreement with and in fact better determined than the macroscopic temperature of the machine. This low rotational temperature corresponds to having only 5.1 % of the ions in the J=1 state and essentially no population in any higher states. 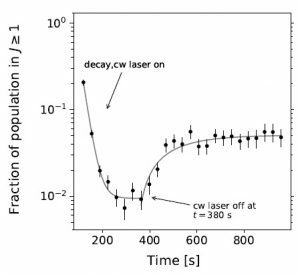 In addition, we used a two-laser scheme in which one laser was used to probe the rotational distribution while the other laser was running in a cw mode and set to a wavelength where all ions with J>0 could be photodetached. This way we managed to obtain a population of 99.1±0.1 % of the stored ions in J=0. The second figure shows the measured fraction of ions in rotational levels other than the ground J=0 level as a function of time after injection when the depletion laser is on until the time t=380 s. We see that the equilibrium situation with the depletion laser on corresponds to a J=0 fraction larger than 99 %. After the depletion laser is switched off the fraction of J>0 approaches the equilibrium value of 5.1 %, corresponding to a rotational temperature 13.4 K. During this time, the ions are actually being warmed up slightly by the weak 13.5 K blackbody radiation. Considering the time dependence of the J>0 fraction after the depletion laser is switched off and the influence of the blackbody radiation field, we were further able to extract the natural lifetime of the J=1 level to be 145±28 s. This is slightly shorter than the value found in the CSR experiment , but in agreement with recent theory . OH– is arguably a very convenient choice for this type of experiments. The finding that thermal equilibrium can be reached in DESIREE given sufficient storage lifetimes in relation to the intrinsic lifetimes of the excited rotational levels is, however, expected to be a general result. 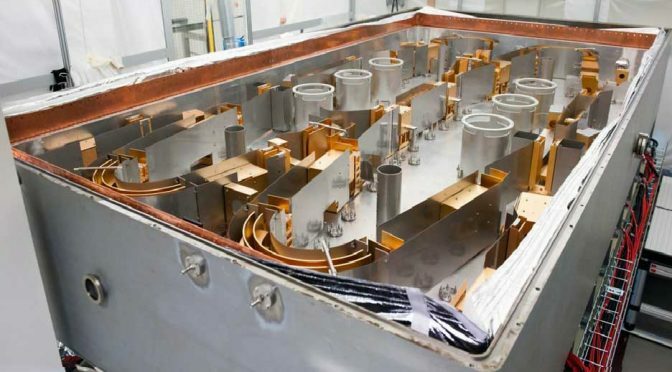 This is very promising for upcoming experiments on interactions between stored molecular ions and laser light or beams of oppositely charged ions under conditions that uniquely mimic those of the interstellar medium. P. Ball, Physics, 10, 93 (2017) https://physics.aps.org/articles/v10/93.